I could have stayed with my travel theme by using any of my Quechuan women weavers images. But how could I possibly ignore my own design for this weeks challenge? My dining table below is from a series of solid granite furniture that I designed and R got made for me based on my drawings. The top is toughened glass. 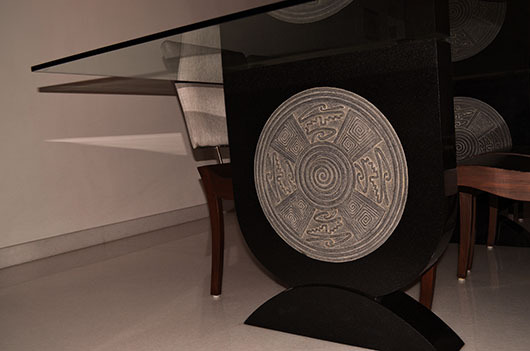 The pattern in the center has been adapted from a book on Mayan art and is carved into the solid 4″ thick granite block. Click here to view more creations. Thank you 🙂 R didn’t make it himself, but got it done. Still I could not have done it without him. Really beautiful design.You are talented indeed.But of course,You have an artist soul. Never saw anything like that. WOW…you are both talented…and it is truly unique, which makes it even more special. Thank you Sue 🙂 I am rather proud of that piece. Stunning and innovative – perfect post. Very beautiful! A lady of many talents. A fabulous creation, Madhu! Love it! Wow, that’s fabulous and beautiful…very talented! I’m glad you shared your creations! Love that it is so unusual. Madhu, that is really beautiful and unique furniture. Sweet of you Mags 🙂 Thank you so much. That’s absolutely an elegant and aesthetical creative work! Thank you for the post, Madhu! This is really beautiful, Madhu! How wonderful to see something in your mind, and have that vision realized. The lad is definitely a keeper! Thank you Naomi. Watching something turn out exactly as you have visualised is one of the most exciting and satisfying aspects of being a designer. Gorgeous piece Madhu. I love the whirly design for the table legs and the clean lines for the chairs… Truly impressive. You are rightfully proud, Madhu. it’s really beautiful! I love it! You have created a truly beautiful and timeless piece Madhu. How wonderful it must have been to have your design brought to life! I am in awe of your talent. You are a generous soul Gilly…thank you so much. Wow thats some solid piece of furniture, bet you don’t move very often! A wonderful table Madhu! I love the Mayan design. You are a very creative lady! What a beautiful dining table to have friends gathering around. It’s wonderful Madhu! Amazing furniture with a very artistic and beautiful Art piece. Truly a treasure in a home. Thanks. SIMPLY EXQUISITE details & STUNNING craftsmanship! I’m impressed! This is a 10 star work. I had no idea you were that creative Madhu :). And your table looks so ellegant. BRAVO! Appreciate your generous comments Paula 🙂 Thank you so much. Glad you think so Imelda 🙂 Thank you! What a beautiful piece of artistry. Love it – a real conversation piece for dinner guests. Madhu that is simply stunning. How creative you are !!! Thanks Deepa. I held an exhibition a few years ago, heck it was 14 years ago, and sold every piece! Lovely – and you can enjoy – and use – it every day! I am bowled over by this piece. Is the supporting end made of granite too? I can’t imagine that it isn’t since that 4″ disc would require stone to hold it. 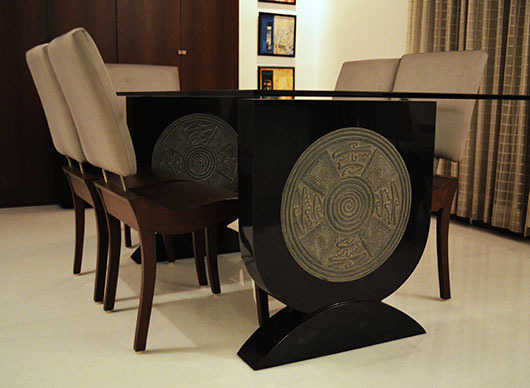 This simple, modern, elegant and polished table holding an “ancient” Myan disc is pure creative genius, Madhu. The logistics of moving this piece are formidable. No rearranging the furniture! I really, really like this. Thanks for posting it. Would like to see the other pieces in the series. It is one single block of polished stone George. The pattern has been carved into that block on either side. The weight is a downside of course, no rearranging like you say 🙂 This was a trial piece with carving, the rest were all plain and contemporary with varying polish and texture effects. Delighted that you liked it. Great design. That is so beautiful!